Most children would be content just to be able to ride a bike but not these kids. From being able to do thousands of push ups to pulling a car, these mini machines are definitely anything but average! Be ready though, by the end of the list you’ll be feeling guilty about not being able to do one sit up. Do you love nailing a good push up? Probably not as much as this young man. Astonishingly Kostash managed 4,000 push ups in a row! It took him a staggering 2 hours and 29 minutes and after that Kostash was disappointed in the number! His personal best was closer to 6,000 but the 4,000 push ups still managed to break a new record in his native Ukraine. Never mind pulling a toy cart around, this 7-year-old pulls around a van for fun! Yup, you heard that right! Jinglong pulled a 1.85 tonne van. 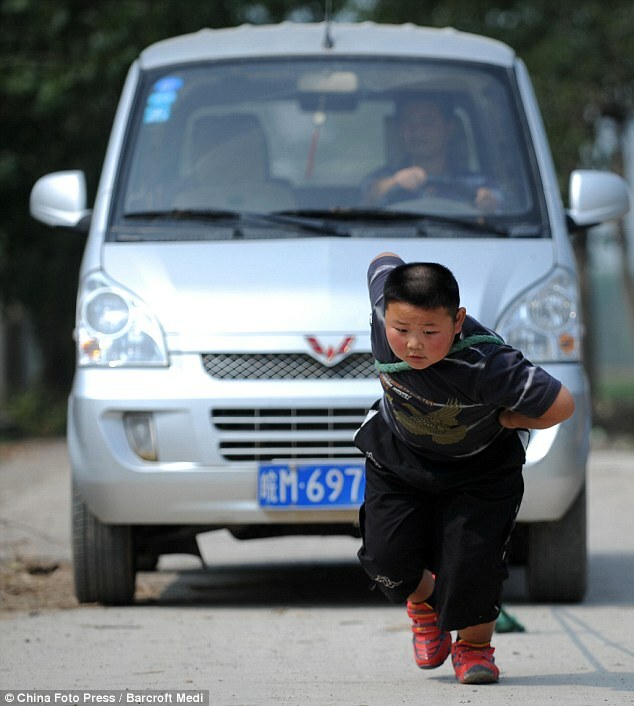 While most kids on this list are heavy set with muscles, this kid from China weighs in at a hefty 110 pounds. His parents apparently knew there was something special about their son from a young age, at 9 months old he somehow managed to lift a 100-pound oil drum! This Russian born teen just might be the strongest teenage girl in the world! At just 15 she participated in the Arnold Classic and bench pressed 331 pounds and impressively was the first girl under the age of 18 to compete in the event. However, Naumova’s strength might not be genetic, after she tested positive to performance enhancing drugs. What 10-year-old sells fitness DVD’s? CJ Senter that’s who! An avid exerciser from a young age this little man doesn’t even like candy. His level of fitness is down to eating healthy and exercising. Senter also avoids weight lifting as he says it is dangerous for young people. Keep an eye out for him since he dreams of playing in the NFL one day. 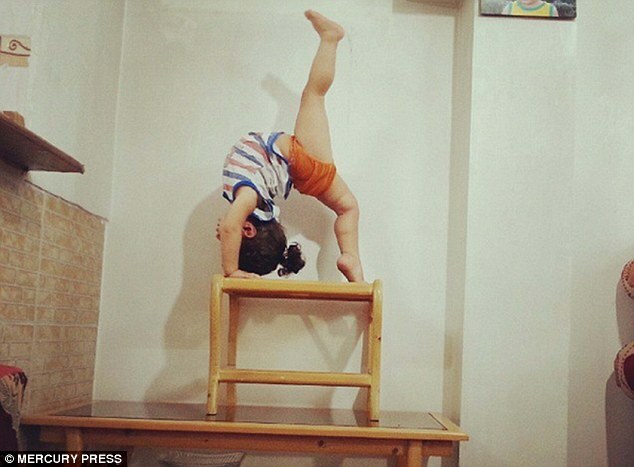 This two-year-old has skills beyond his years! A gymnastics enthusiast he is able to do 360 degree spins on a trapeze, weighted splits and can do press ups with a 6.5kg weight on his back. Not impressed yet? He only practices for 10 minutes each day. His Iranian parents have no plans on making any money off their young boy’s skills, they say he just does it for fun. Talk about a super duo! Jessica and Dylan Best inherited their love of weight lifting and exercising from their parents and even appeared in a documentary called “The World’s Strongest Family”. Incredibly they estimated that they work out for an average of 240 hours a week! Now, it is just an estimate but how do they have time to be kids?! Most 14-year-old boys spend their days riding bikes, playing video games and playing with friends but Cosmo Taylor is anything but normal. Not only is he a body building enthusiast but enjoys bragging about his physic on social media. He consistently boasts about his 6.5% body fat on Instagram. 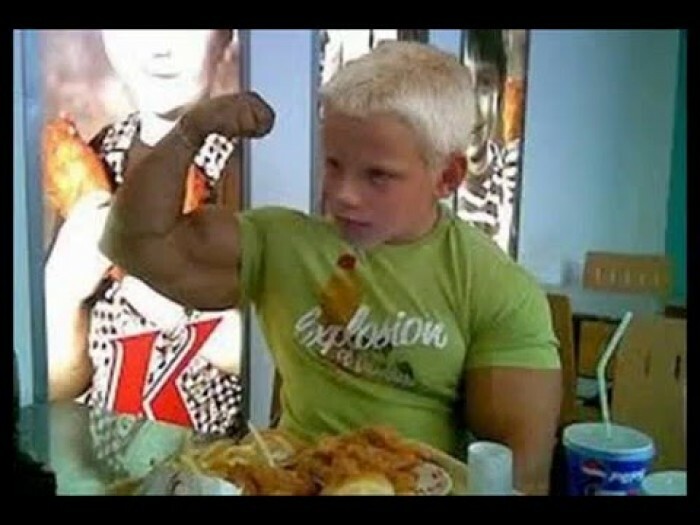 Dubbed the original strongest boy, at the age of just two Sandrak started exercising excessively and soon enough he was able to do 600 push ups and 300 sit ups. Oh and he somehow had a body fat percentage of 1%! However after a few years in the spotlight it became too much from the Ukrainian born strong boy and he gave up the gig in order to make friends at school! These brothers are beyond impressive! Giuliano garnered a massive amount of publicity when a video of him holding the human flag stance for nearly two minutes went viral. His younger brother is just as incredible and is able to do some crazy gymnastic moves. Sadly though it is rumoured that their father pushes them to exercise in order to make money from their performances. What were you doing in between classes at 13? Bench pressing and weight lifting? Probably not, but then again you were normal and not at all like this young lady. At just 10 years old Naomi Kutin managed to squat 215 lbs! That was double her body weight! What really set Kutin apart from others was a few years later when she squatted 250 lbs. What makes this teenager different is the fact that unlike a lot of other strong kids, she doesn’t appear to have that much muscle mass. She basically has the body of a normal girl! Specialists believe it might be down to her genetics since her family (who happen to be circus performers) also have shown exceptional strength. 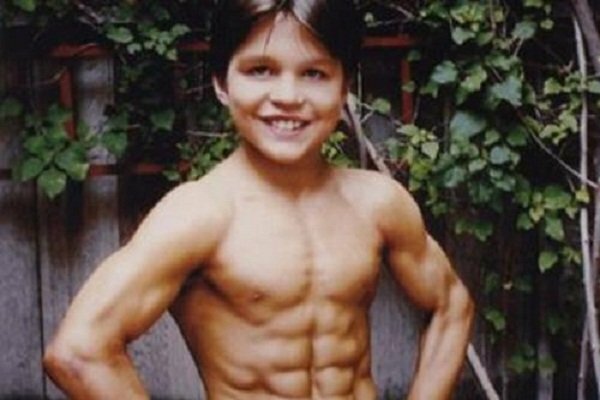 This 12-year-old dreamed of being a body builder, so he became one. So after two years of training her entered a competition and impressed with his squats but what really got people interested was a record he set for dead lifting 300 pounds! More than twice his own weight! Oh, and he won the completion of course. This young fella is definitely one of the most well known on the list after annihilating the competition at the World Weightlifting Championships. Not only was he the youngest competitor but since then he has been dubbed the strongest teen in America and developed quite a cult following. Also he happens to be amazing at basketball! Or as he is affectionately known “Little Arnie” has become an internet sensation, not only because of his likeness to the famous movie star but also because of his sheer size and ability to lift. Not only can he lift double his body weight but he did it at age 12! Unlike a lot of strong kids, Kane has continued his obsession with body building into adulthood. Make sure you SHARE this article with your friends and see what they think!